Bioglan Superfoods Supergreens Plus contains 101 vital ingredients which provide the full spectrum of A-Z nutrients derived from supergreens, superfoods, fruits, vegetables, herbs and live cultures. It provides a rich source of vitamins C and B12 which contribute to normal energy-yielding metabolism, immune system function, and can help prevent tiredness and fatigue. With activated charcoal, matcha green tea, baobab, purple kale and moringa it is the ultimate greens powder! 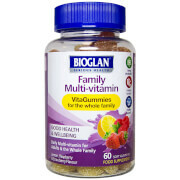 Bioglan Superfoods Supergreens is rich in Vitamin C which helps to maintain the normal function of the immune system. Enjoying Supergreens Plus is a great way to help you on your way to getting 5 portions of fruit and vegetables every day and topping up your nutrient levels. Supergreens Plus is a source of Iron which contributes to normal energy yielding metabolism and can also help prevent tiredness and fatigue. With added pre and probiotics, Supergreens Plus can help to balance the good bacteria in your gut and improve the digestion of vitamins and minerals. Add 2 teaspoons (10g) to water, milk, smoothies, yoghurt, cereal, baking or other foods you enjoy daily. spirulina powder, pea protein isolate, apple juice powder, emulsifier: sunflower lecithin; sweetener: steviol glycosides; chicory inulin, flaxseed powder, citrus bioflavonoids extract, organic chlorella powder, alfalfa powder, wheat grass powder, barley grass powder, L-ascorbic acid, broccoli powder, papaya powder, calcium citrate, flavourings, rice bran powder, potassium phosphate, magnesium citrate, beetroot powder, purple kale powder (1.7%), black tea extract 4:1, acidity regulator: citric acid; DL-alpha-tocopheryl acetate, calcium carbonate, activated charcoal (0.8%), purple asparagus extract 4:1, strawberry fruit powder, raspberry fruit powder, rhodiola rosea root powder, orange fruit powder, coconut water powder, avocado juice powder (0.8%), guarana seed powder, moringa seed powder (0.8%), baobab fruit pulp powder (0.8%), maitake mushroom extract 8:1, turmeric powder, maca powder, lucuma powder, sweet potato powder, carrot powder, alpha-lipoic acid, spinach powder, bromelain, resveratrol, microcrystalline cellulose, calcium phosphate, banana powder, rosehip powder, ascorbic acid, calcium citrate, pineapple powder, beta carotene, acai freeze-dried powder, kale powder, shiitake mushroom powder, reishi mushroom powder, slippery elm powder, blueberry extract, blackberry powder, artichoke leaf powder, vitamin B3 (nicotinic acid, nicotinamide), zinc bisglycinate, ginger extract, acerola juice powder concentrate, liquorice powder, cocoa bean extract, rosemary leaf extract, clove powder, watermelon powder, chia seed powder, co-enzyme Q10, kelp powder, beta-glucan, green tea extract, grapefruit powder, ashwagandha root extract, gotu kola extract, dandelion root extract, goji berry powder, lemon peel powder, burdock root extract, bifidobacterium bifidum , Korean (panax) ginseng root extract, kiwi fruit powder, olive fruit extract, calcium-D-pantothenate,pyridoxine hydrochloride, thiamine hydrochloride, riboflavin, lactobacillus acidophilus, bilberry fruit extract, manganese gluconate, copper gluconate, ergocalciferol, milk thistle seed extract, grapeseed extract, folic acid, D-biotin, chromium picolinate, sodium selenite.